At the soggy Sandy 10 mile race on Sunday morning Spartan YUKO GORDON won her category in 73 minutes 31 seconds which gave her an amazing age related score of 95.7%. She said her time was only 1 minute and 44 seconds off from UK’s all time best for women 65 plus for 10 Miles, maybe next time. She felt her legs were heavy from Great Barrow marathon last week. Yuko was awarded the Roger Wadeley trophy for her age graded 95.7%. She was worried about gels and water stations before the race but took no gel nor water during this race. And she says she is getting more nervous about the London Marathon each day. Both TREVOR and KAREN BROOM ran the Sandy 10 mile on Sunday. It was Trevor ‘s first official race and he ran the whole 10 miles without stopping and finished in 1.53.33. Karen finished just behind him in 1.53.56. JULIE SHADBOLT ran a new personal best of 1:27:31 and TRUDIE MOLLOY a PB of 1 hour 29 minutes. BARRY KING ran his fastest “10” since turning 50 – 1:29:11. Altogether Fairlands Valley Spartans had eleven runners. DANNY SCANLON was quickest from the club in 1 hour 8 minutes 12 seconds. Yuko was second but JIM BROWN was third in 1:22:04. Next came JULIE SIMMONS with a high scoring 1:26:45. KAREN PALMER came in just ahead of Julie in 1:27:30 and JOANNA WALKER beat the two hours with 1:59:45. 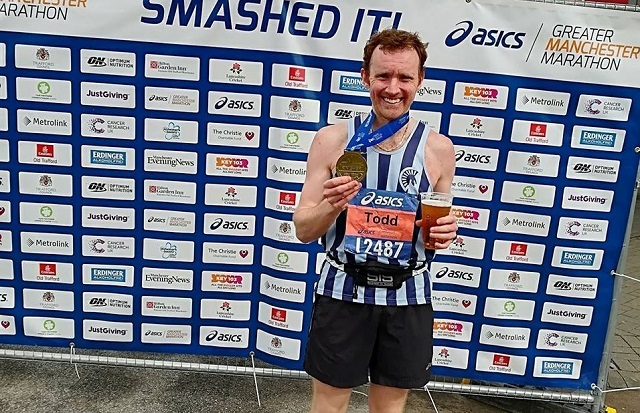 On his twelfth attempt and following several near misses all the hard work paid off for Spartan TODD GRAY as he joined the marathon sub three club at the Manchester Marathon on Sunday. He stuck to his race plan and finishing in 2 hours 58 minutes 36 seconds. He was 359th out of the 20,378 finishers. Two other Spartans were there JOHN ADAMSON with 3:53:38 and ROBERT WRIGHT in 4:41:33. The Spring marathons are really getting going. Three Spartans flew off to the party isle of Ibiza to take part in the second Ibiza marathon and 12K. Carol Paul came second in her age group in the marathon with 4 hours 43 minutes 37 seconds and Erica Grayson got a new PB by nearly 13 minutes of 4:25:07. Emma Martin ran the 12k enjoying the sunshine and support. Erica and Carol said the Ibiza Marathon was a well organised and supported event. They recommend it even in the heat and with the 15K of incline. Tim Robinson journeyed to Paris for his third time of running the Marathon De Paris. Most of his spring training in the UK has been in sub zero temperatures and Tim suffered again with the heat but managed to finish in a time of 5:01:57. London is on Sunday 22nd April and the Spartans have booked two coaches. Stevenage and North Herts Athletics Club welcomed nine Spartans to their open meeting at Ridlins on Saturday afternoon. Eight competed in the 1500 metres in which STUART HAYCROFT was fastest in 5 minutes 6.57 seconds followed by ALISON WOOD in 5:24.80 and CRAIG BACON in 5:36:14. ANDY JAY was determined to get under 6 minutes and did it with 5 minutes 57.92 seconds. In the “B” race PENNY SCHENKEL ran a new personal best of 7 minutes 4.24 seconds; “stuck” at not much more than marathon pace JIM BROWN came in with 7:14.90 closely pursued by MONICA SMITHSON in 7:19.65. PAUL HOLGATE ran the three and three quarter laps between the white lines in 7:45.65. Congratulations to Stephanie Mayfield who did the pole vault. She set a personal best and club record of 2 metres 10 centimetres. Some Spartans will be back at Ridlins for the county track and field championships on Monday 7th May. GRANT RAMSAY was fourth out of the 325 finishers in the Harlow 10K in 35 minutes 38 seconds. LEE PICKERSGILL finished the Bournemouth Bay Run 10K in 49:15 close to a PB (personal best) but the cliff climb at 5K was tough. John NELMS (and 399 others) ran the 50 mile South Downs way race on Saturday. Weather was perfect with light wind and clear skies. Some beautiful views across the south coast from the top of the ridge. He finished comfortably in 10 hours 35 mins. That’s his last long training run done for the upcoming Thames Path 100 miler in four weeks. Congratulations to Daniel SUTTON and Verity FISHER who ran their first parkrun as a married couple in Barry Curtis, New Zealand with times of 22:23 and 24:55 respectively. Two others travelled overseas this weekend, Adrian DONNELLY ran Malahide in Dublin in 21:01 and Madeleine PRITCHARD ran Hasenheide in Berlin with a time of 32:41. More locally, 11 Spartans ran in their stripes for the first Saturday of the month in Stevenage with 4 achieving new PBs. Danny SCANLON was 4th finisher with 19:20 PB, David SCOTT completed in 22:35 PB, Jonathon JONES 24:01 PB and Niki PLUMB 35:25 PB. Jo BOWDERY was 3rd female in a time of 23:23. Other Spartans to complete the course included Barry OSBORNE 20:56, Martin DUDLEY 22:30, Calantha CHAPMAN 28:29, Steven DOBNER 29:20, Sally PHILLIPS 31:54 and Karen BROOM 32:03. Others to run this weekend included 1st place Dan MCALPINE with a time of 17:10 at Luton Wardown. Natalie LAWRENCE completed Houghton Hall, third position overall, first female, in a time of 19:24. Completing their 10th Parkruns, Hannah NEALE (28:17) and Alexandra WHITEHOUSE (34:20) competed Market Horborough parkrun, Roger HARDMAN completed Newcastle in 27:42, and Michael O’KEEFE completed Westmill in a time of 28:28. On Sunday CAROLE SHELDRICK enjoyed the Stevenage Decathlon 5k race with Caroline Croft and many other Spartans. She said it wasn’t the easiest 5k she’s run, Stevenage likes to make us work hard with all those lovely Stevenage hills. Carole finished in 27:49 with CAROLINE CROFT in 30:12. SIMON SYPULA had a bit of fun during his 26:45 while SAM SIMMONS, recently back from injury, achieved 27:52. On Saturday Sharon and Mike Crowley completed the 2nd Capital Challenge. This was a LDWA event around London. It started on the South Bank taking in some familiar sites, but passing through some hidden gems. The walk was surprisingly hard with 2000 feet of climb, they finished the 27.6 miles in 7hrs 47, finishing in the Olympic Park. (LDWA = Long Distance Walkers’ Association).